CENTENARY, Ohio —The bad news was that the new-look Blue Devils didn’t win. The good news, though, was that Gallia Academy didn’t lose either. 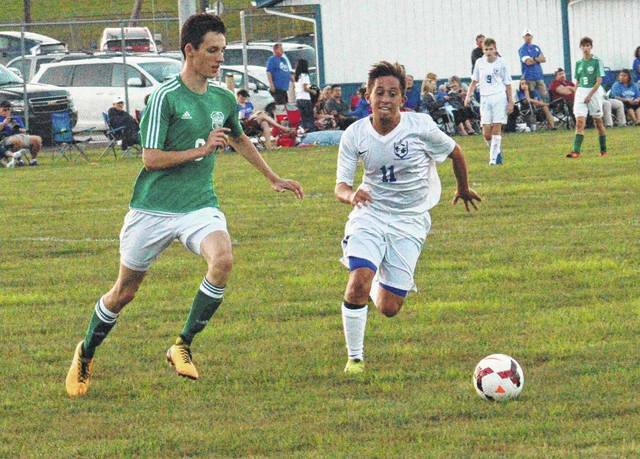 Instead, a young Gallia Academy High School soccer squad — in its season and Ohio Valley Conference opener on Wednesday night at Lester Field — played the visiting Fairland Dragons to a 2-2 draw. The Blue Devils — which lost 13 players from last season to either graduation, transfer or the one-year foreign-exchange program — defended about as well as could be asked for, and almost made it through with a 2-1 win. However, one defensive breakdown allowed for Fairland’s game-tying goal with only two minutes and 48 seconds remaining — when Tyler Webb took a breakaway pass and pulled GAHS goalkeeper Tristan Posley up in the box. Webb, who scored the Dragons’ initial goal on a free kick with 28-and-a-half minutes remaining in the first half, saved the night for the visitors with the equalizer. With that, the Blue Devils —defending their OVC co-championship from last season — did see an early opportunity to go one-up in the league standings slip away. Still, given the heavy personnel losses including 10 starters, first-year Gallia Academy coach Cory Camden wasn’t disappointed. There was really only two negatives —that being Fairland’s two goals. Camden explained what happened on the Dragons’ late marker. The Blue Devils’ offense, on the other hand, performed better in the second half — and got its two goals in less than eight minutes. In fact, Gallia Academy only needed 15 seconds to strike for the 1-1 tie —when Andrew Toler, off the second-half kickoff — long-balled a pass to Justin Day, who got a great run in front of the Dragons’ defense. Just seven-and-a-half minutes later, Fairland was whistled for a handball in the box —giving Gallia Academy a penalty kick. Day took the PK, and beat Dragon goalkeeper Ben Ward for the 2-1 advantage with 32:13 remaining. That penalty kick was one of only five shots on goal for the Blue Devils, which also mustered five corner kicks. But bringing Day up to the striker spot, Camden explained, was key. “I felt like we had a little of the possession and we had some chances, but the first half, we never really got anything on goal. Making the move of bringing Justin Day up top at the start of the second half really stressed their defense with his speed and being able to finish,” said the coach. The Blue Devils’ best first-half chance came with eight minutes remaining, when freshman Koren Truance just missed a shot high of the net. But the Blue and White will be a defensive-oriented club this season, and will be in close encounters even when not scoring many goals. And, even though it wasn’t an OVC victory on Wednesday night, it wasn’t a loss either. The Blue Devils return home, and step out of conference action, on Tuesday night against Point Pleasant. Gallia Academy senior Pierce Wilcoxon (11) chases down a loose ball against Fairland’s Sean McKiney during Wednesday night’s Ohio Valley Conference soccer match at Gallia Academy High School’s Lester Field.